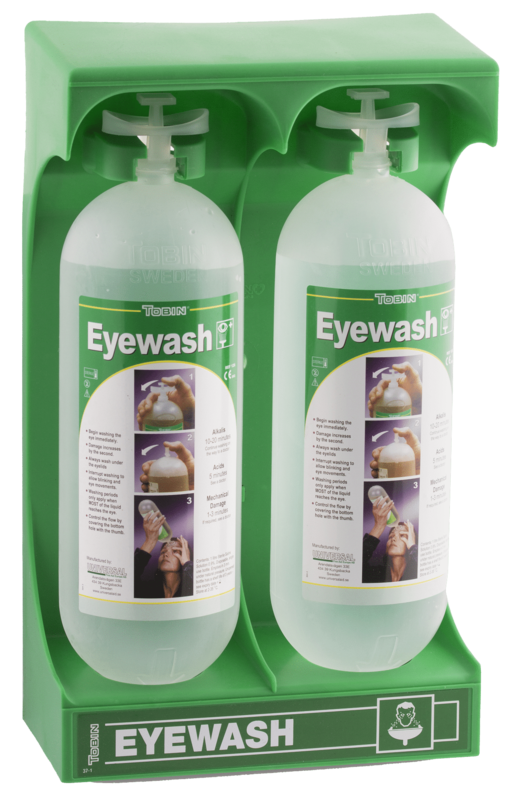 In 1965, Michael Tobin, the founder and inventor of Tobin Eyewash and the Tobin Bottle, got the idea of an eyewash with liquid enough to wash the eyes constantly for 15 minutes. Also adding an eye supporting ring to the bottle facilitated prolonged washing during transportation to a hospital. The patented idea was soon acclaimed by media and the Swedish work environment authority. In 1984 the Tobin Eyewash began large-scale production. By attending expos and trough customers, the concept of prolonged eye washing after exposure to harmful chemicals spread over the world. Today this is the standard procedure when washing chemicals from the eyes. During the eighties and nineties the export in Europe expanded. In 2007 the company was bought by the Swedish AL Gruppen AB, who continues in the ingenious spirit of Michael Tobin to develop eyewash systems. Eyewash Stationary stand for stationary work places. Eyewash Stationary stand for mobile units such as trucks, boats and trains. Dust protected cabinet suitable for all work places.